Home / Education / Inspiration / Local News / EDUCATION: UNIBEN best graduating student reveals secrets of her success. EDUCATION: UNIBEN best graduating student reveals secrets of her success. 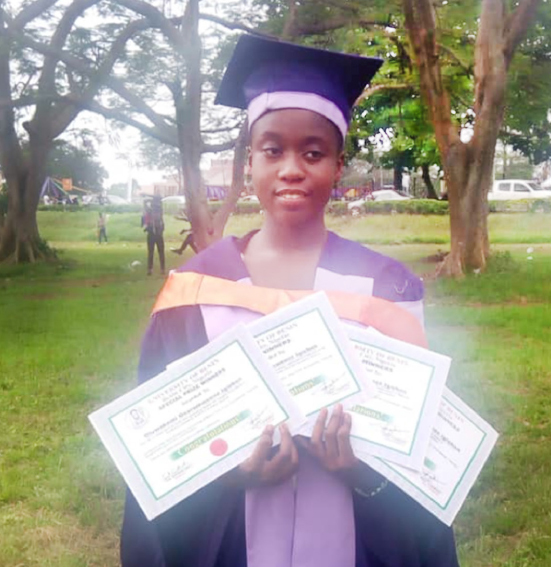 The overall best graduating student of the University of Benin (UNIBEN), Oluwakemi Igiehon, has attributed her academic feat to G‎od and hard work. In an interview with our Correspondents, ‎Oluwakemi who garnered a CGPA of 4.91 to emerge the best, advised students to work hard and “remember God because true and lasting success comes from Him”. My name is Oluwakemi Igiehon. I graduated from the Department of Microbiology, Faculty of Life Sciences, University of Benin. I emerged the overall best graduating student of the university in the 2016/2017 academic session with a CGPA of 4.91. I am 21 years old from Oredo Local Government Area of Edo State, I am from an average family and growing up was not easy for me and my family members because we had financial issues. Finance was always a problem for us and even to secondary school and the university, it has always been a problem but I thank God because finance did not hinder me but God made a way for me. My parents have always been helpful, pushing me and to bring out the best out of me. The secret of my success is God because I could remember very well that I was always having academic issues when I was in secondary school. There was a turn-around in my academic life when I gave my life to Christ in SS III and it was like the spirit of excellence that came upon Daniel, came upon me and I started doing things extraordinarily and God expanded my horizon of knowledge, helped me to study, gave me a push, motivation to be the best that I can be. So, I can say in summary that the secret of my success is God plus hard-work. How many times did you write JAMB? Well, I wrote JAMB just once, which was in 2013 and passed it, gained admission into the university immediately. At what point did it occur to you that you were going to make First Class? It was in my final year that I actually knew that I will make First Class because in 100 level, I did not have good grade point but I had a very good one from 200 level, my GP started raising progressively. From then I knew that I will make First Class but I never knew that it will be a CGPA that will make me the overall best student in the university. What were your memorable days in the university that you can not forget in a hurry? One of the days I will not forget was when I was in 100 level and we were having a practical class. I forgot my practical manual and we have already filled in our assignment and work inside, then the lecturer was collecting it that day and there is nothing I could do about it. There was no way I could go back to the hostel to collect it. So I did not know when I started crying because I thought I would fail the course and it was a class of about 500 students or more and my colleagus just started laughing at me when they saw me crying. So,I will never forget that day although it was a sad one for me but later the lecturer pardoned me. Did you encounter sorting in the university? No, not at all. My department lecturers, they were really fair to students. There was nothing like sorting or blocking. To the best of my knowledge, I never encountered anything like that. Whatever I have today, is what I worked for. I never blocked or sorted any lecturer or bought any handout. They were very fair to me. The first thing I will tell students is that they should remember God because true and lasting success comes from Him. When you take a look at the life of Daniel and his colleagues in Babylon, they excelled because of God. They were very hardworking too because the spirit of excellence was in them. It was something supernatural. So, you need God in your life to make your success stand the test of time. Did you participate in any protest on campus? Not at all. I was not a politically inclined student. The next plan on my list is studying for my masters’ degree and I desire to study abroad. How did your parents react to the news of you being the overall best student? They were overwhelmed with joy. They were so excited and thanked God for it because they knew that it was God’s hands that were upon my life and they were very proud of me.